All models are 7 studs wide! Suitable for 9V track. Engine LB04 with Minfig driver. 9V motorset is optional/not included. Can also be used on 12V track with a 12V motor. 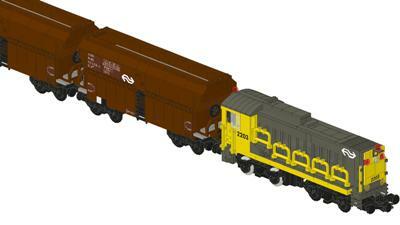 The Wagons have 2 compartments with doors on both sides. All doors can be opened. Stairs to climb to the top in the middle of the wagons. With very detailed stickers of the Dutch version. Only 1 bogie of the LB04 included. For the other bogie you need the 9V Motor.